The most famous resident of this central Florida city is Mickey Mouse, the cartoon creation of animated movie tycoon, Walt Disney. His vision has turned Orlando, and the adjacent Lake Buena Vista and Kissimee areas, into the world's busiest, biggest and best-known concentrated tourist paradise. Disney bought up land in the area with the aim of establishing his dream theme park back in the 1960s. He died before the first park, the Magic Kingdom, officially opened in 1971. But his legacy lives on. Currently the Disney empire in Orlando includes four theme parks, dozens of smaller attractions, thousands of hotel rooms and holiday apartments, hundreds of restaurants and snack bars, and even two cruise ships. 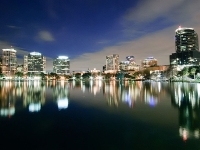 It is not only the Disney dazzle that draws visitors to Orlando. There are plenty of other attractions, like Universal Studios, Discovery Cove, and the beloved SeaWorld, all adding to the maelstrom of thrills this city is now renowned for.